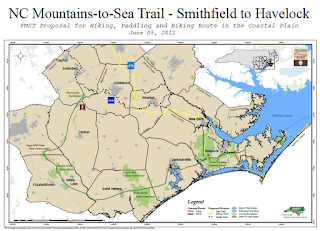 North Carolina's Mountains-to-Sea Trail (MST) is a big deal - destined to become one of the great long-distance trails in the eastern US. More than 1000 miles long, it stretches from Clingman's Dome in Great Smoky Mountain National Park on the Tennessee border to Jockeys Ridge State Park on the Atlantic Ocean at Kitty Hawk, NC. In between, it meanders along trails that roughly parallel the Blue Ridge Parkway, climbs Mt. Mitchell, highest mountain in the eastern US. Leaving the Parkway vicinity near the VA border it heads east passing notable landmarks including the unique butte called Pilot Mountain (shown above, on a section of the MST that was just opened). There is some country road walking before the trail begins to skirt the vibrant metropolitan centers of Greensboro and Raleigh, often following off-road trails beside reservoirs. 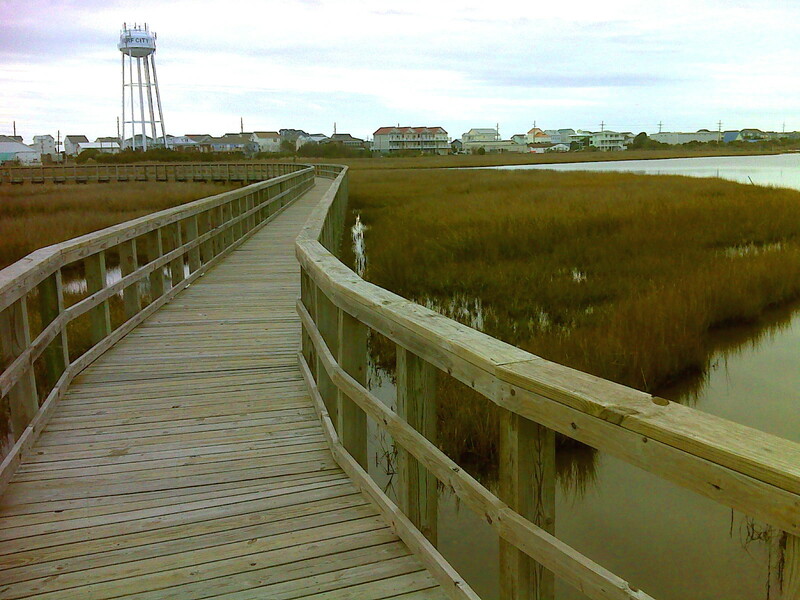 And here is the big news that has me really excited: There's a newly approved hiking route for the trail that takes it within a day's walk of my beach-front condo at North Topsail Beach (see map at right). Turn-by-turn directions for this route were just finalized in December 2012 (by a GIS student working at a desk - nobody's actually hiked it all yet, so I may be the first). 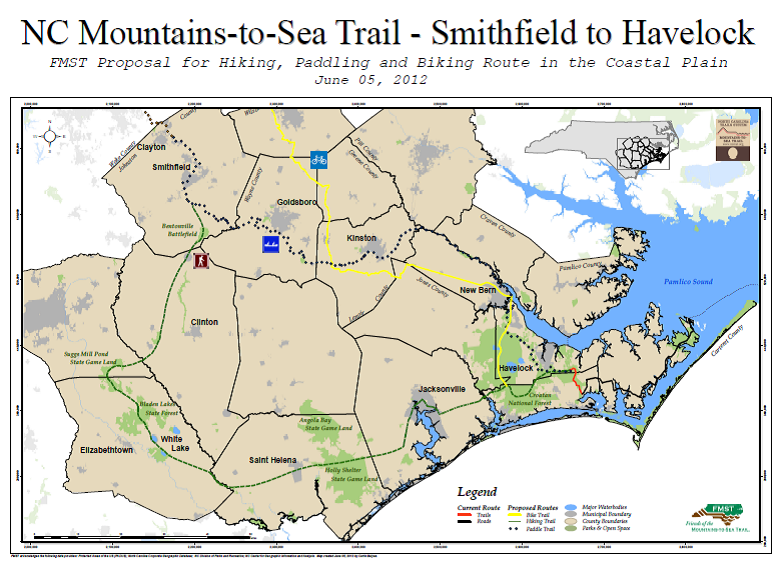 In fact, there's a chance that the trail could even include Topsail Island itself. I've just joined the Friends of the MST and spoken with their hard-working and dynamic Executive Director, Kate Dixon. I'm volunteering my services as a scout and trail blazer for this new section. 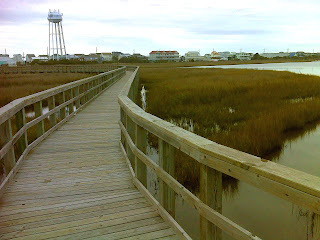 I've already been out doing some scouting and have started walking what I hope will eventually be the final choice for a trail route, which would take the hiker through Surf City, NC's Soundside Park then walk the beach for nine blissful miles (including public rest rooms with flush toilets every few miles). There's even a new book about the MST (in press) by Danny Bernstein, who thru-hiked the MST in 2011. Look for its release in the next few weeks. I've mentioned Danny before - she's the wife of Appalachian Trail Board Member and IPCC (Intergovernmental Panel on Climate Change) contributor Lenny Bernstein, who I met on the AT during my 2012 double thru-hike. 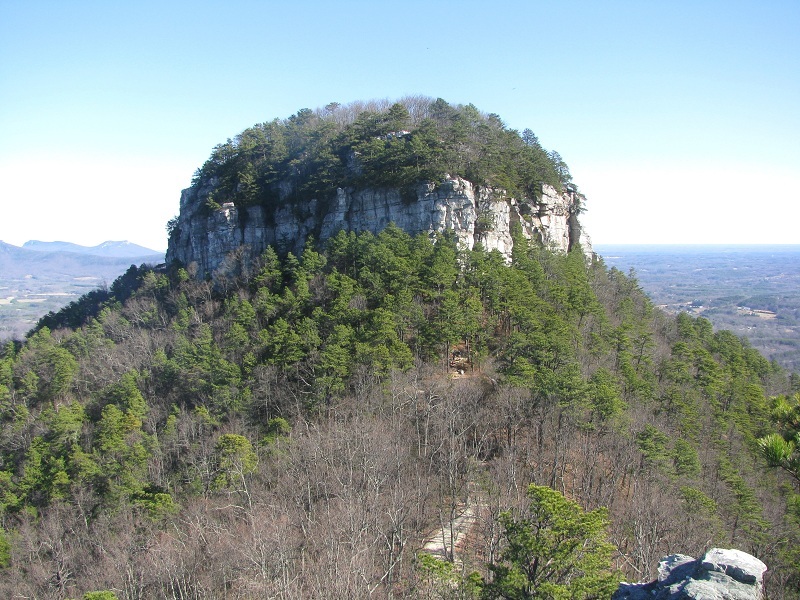 Danny's an avid hiker and author, and her "This Hiking Life" blog is one of my favorites. Plans for me are to start hiking west on the MST from my beach home, eventually connecting with the nearly four-mile piece of the MST that follows the AT from Clingman's Dome to the Fork Ridge Trail. This connection is part of my 'Personal Continuous Footpath' project to link, via my own personal footprints, every place that I've ever lived. And when I'm around home, I'll be scouting, and eventually, I hope, doing some trail building in places like the Holly Shelter and Stones Creek Game Lands. It feels great to be back out on the trail with a clear 'destination' in mind again. And the January weather here in coastal NC has been co-operating - some days lately, it's been in the 70's. Sounds amazing! I'm dying to get back out there. Hope to see you at the annual meeting next month.